Affiliate Marketing and Adsense, What is benifits for Blogger? 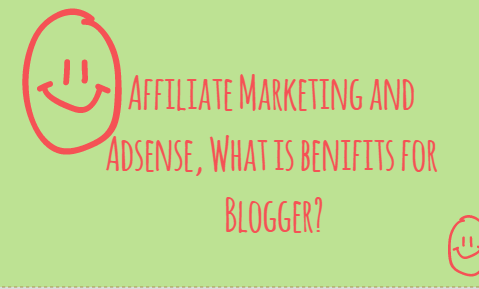 Today we will talk about Affiliate Marketing and Adsense. When we think of Affiliate Marketing, it is natural for us to rise in the question "Affliate Marketing or Adsense, who is better?" This is a tricky question but if you are a professional blogger like Harsh, Do not want to compromise with any kind and would not want to get involved with affiliate marketing to screw up the opportunity. After reading this post, you will be able to decide what is best for you. Affiliate Marketing or Adsense. It is a very common misconception that Google is against Affiliate Marketing, but it is not true. Google allows you to have an affiliate link, but keep in mind that you use them on quality blogs. If you publish low quality content and also add ten affiliate links with that low-quality content, then any search engine bots will not accept such a shoddy work. It is easy to join Affiliate Marketing, compared to the approval of Google Adsense account. Affiliate Marketing pays more than Adsense. Most Affiliate Companies offer PayPal as a payment method, while Adsense does not. You can find affiliate products for every niches while Adsense is not allowed for some niches. Adsense offers recurring income while affiliate marketing pays on one shot at a time. Adsense is managed by Google alone, while many small and big affiliate companies. Affiliate ads are more attractive, but we do not have any control over adsense ads. See these points written above, Affiliate Marketing enters more than Adsense and is beneficial. There are still some things about affiliate marketing before drawing your conclusions that you should know. Affiliate Marketing only works on some pages, so every page of your blog will not make money for you. Adsense, on the other hand, will also work on those pages where Affiliate Marketing Products does not work. When it comes to making money online, AdSense is the backbone of any blogger, because it is helpful in getting your cash machine to flow, though per day payout is less than an affiliate sale. One thing that can be done here is to replace the Adsense Spots above any post with an Affiliate Banner. It can be risky, because it can perform well and not even. If those banners have 5 to 7 sales in a month, then this would be better for affiliate banners than the Adsense unit. But if this does not work then the thing will end up at $ 0. It is suggested that you use a combination of Affiliate Marketing and Adsense, and that is also the right way that you are not only affiliate marketing blogger. If your content is good then you will earn great by the end of the month. Keep in mind that most of your clickable areas like above the post, 350bar of the sidebar are covered with adsense ads. You can select these fields for Affiliate's placement. Always remember one thing that the maximum AdSense unit is not guaranteed that your revenue will be max. In fact, 1-2 ad units which provide mixed results with links and search units are mixed. If your blog is doing great ayr targeted traffic recieve, then affiliate marketing 1-2 banners can perform well. Let us know your opinions only, what do you prefer ... Adsense Ads, Affiliate Banners or both?